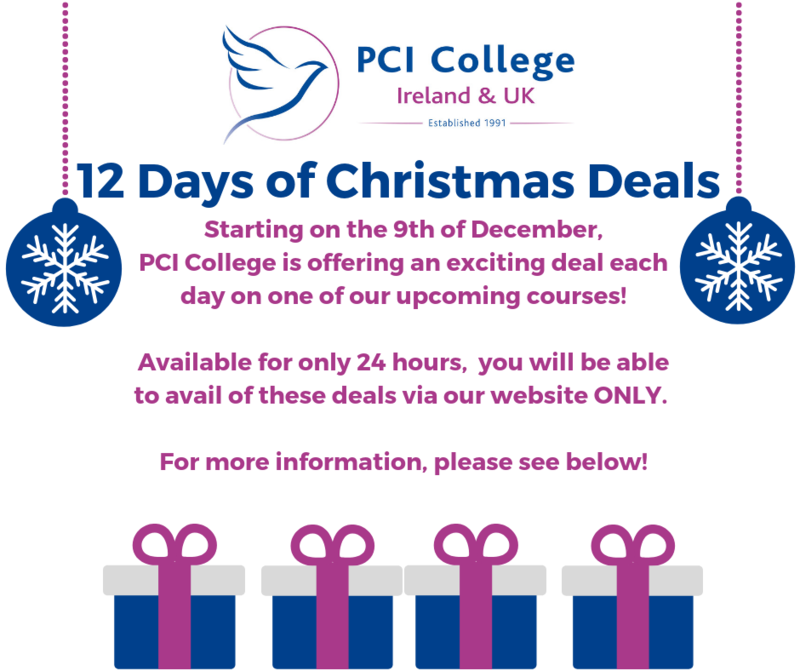 PCI College is pleased to announce a number of exclusive deals available on a variety of upcoming courses across 12 days of December! Starting from 10 am on Sunday 9th December 2018, these deals will only be available one day at a time for a total of 24 hours each until the final deal on Thursday 20th December 2018 at 10 am, so make sure to book during these times to avail of the deals! For more information on what deals you can avail of, please see below! You'll be able to book via the links below during the designated times. If you have any queries about any of the courses, please don't hesitate to contact us at 01 464 2268 or enquiries@pcicollege.ie. Please note that all deals are subject to availability. Once a course reaches full capacity, the deal is no longer available. Bookings made for all courses associated with this offer prior to, or after the fixed period, are not affected by this deal in any way.